&#0160; !http://nfpa.typepad.com/.a/6a00d8351b9f3453ef01a511d042dd970c-320wi|src=http://nfpa.typepad.com/.a/6a00d8351b9f3453ef01a511d042dd970c-320wi|alt=Remembering When Logo|style=margin: 0px 5px 5px 0px;|title=Remembering When Logo|class=asset asset-image at-xid-6a00d8351b9f3453ef01a511d042dd970c img-responsive! Members of the fire service and allied health professionals who recently participated in the annual Remembering When™: A Fire and Fall Prevention Program for Older Adults conference have returned to their communities and are now implementing the program. The 2 ½ day conference took place the first week of June in Las Vegas in advance of the NFPA Conference & Expo. During the highly interactive training, 30 teams from the fire service and representatives of agencies that serve older adults learned effective ways to conduct presentations for older adults to help them reduce their risk of fires and falls. The program, recently updated, can be downloaded at no cost from the NFPA web site. !http://nfpa.typepad.com/.a/6a00d8351b9f3453ef01a73ddb801f970d-800wi|border=0|src=http://nfpa.typepad.com/.a/6a00d8351b9f3453ef01a73ddb801f970d-800wi|alt=2014 RW conf1 Group Photo|title=2014 RW conf1 Group Photo|class=asset asset-image at-xid-6a00d8351b9f3453ef01a73ddb801f970d image-full img-responsive! &#0160;!http://nfpa.typepad.com/.a/6a00d8351b9f3453ef01a73ddb82d3970d-800wi|border=0|src=http://nfpa.typepad.com/.a/6a00d8351b9f3453ef01a73ddb82d3970d-800wi|alt=2014 RW conf flip chart talk|title=2014 RW conf flip chart talk|class=asset asset-image at-xid-6a00d8351b9f3453ef01a73ddb82d3970d image-full img-responsive! 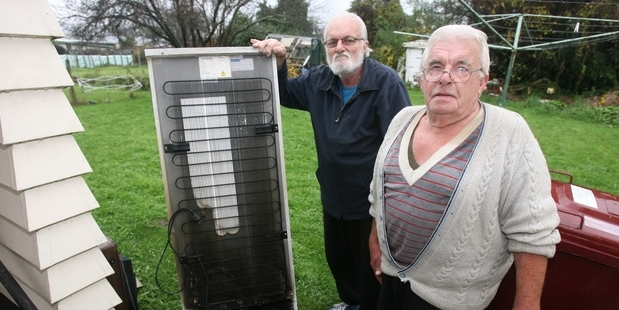 John Little, 66, was confused when he heard his smoke alarms sound at about 11pm. That’s because he’s diligent about testing them regularly. “I thought that’s odd because I’d only just checked and changed the batteries,” he said. When Little entered the kitchen, he saw flames coming out the back of his refrigerator. He grabbed a bucket of water and threw it on the fire. From there, he and his older brother Bruce, 77, escaped their home safely. Yet another success story that reinforces why it’s so important to test your smoke alarms once a month and replace the batteries each year.